Drought conditions in Northern California have had an impact on some popular annual river celebrations, including one cancellation, but others remain scheduled as planned. The Healdsburg Water Carnival, popular in the early 1900s and resurrected from 2011 to 2013, will not be held this year because of the drought, according to Sonoma County Regional Parks. Last year’s event was held July 27. “The low flow due to the drought makes it unrealistic for us to create the summer swimming area at the beach. Plus, the city is scheduled to do a major retrofit on the Healdsburg Memorial Bridge, so the beach where the carnival is held would be a construction site this summer,” said parks spokesperson Meda Freeman. 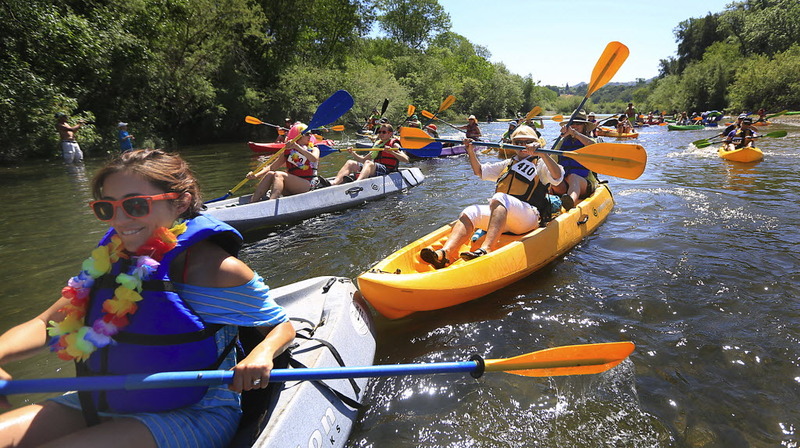 The Great Russian River Race at Healdsburg will return for its fourth year on May 3, but with one racing event instead of two. The 15-mile race is canceled because of low water conditions, and the five-mile race will be limited to 200 racers. There will be a free River Race Party from noon-4 with live music by Cahoots and the Church Marching Band and a Water Conservation Fair. Information: greatrussianriverrace.com. The Rivertown Revival, held annually on the Petaluma River since 2011, will take place July 19 at Petaluma’s River Heritage Center on the McNear Peninsula, said organizer Kelin Backman. Information: rivertownrevival.com. Monte Rio’s annual Independence Day weekend celebration on the Russian River will be held as usual July 5 and 6, with fireworks July 6, said Diane DeMartini of the Monte Rio Recreation and Park District. Information: mrrpd.org.